Welcome to Blog #3 - the Kinesthetic Learner. This is the third blog in my Series on Learning Styles. In Blog #1, we explored the Visual Learner. 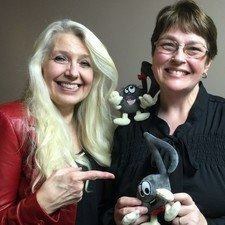 Blog #2 was the Auditory Learner. In this Blog, we will discuss the Kinesthetic Learner! 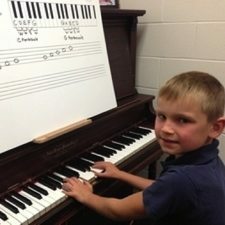 Do you have a student that likes to play their music all over the piano? Do you ever get motion sickness while watching your student stand, then sit, then spin, then rotate, then flip…all while completing their theory? Do you have a student who doesn’t “get it” until they actually “do it”? Then you probably have a Kinesthetic Learner (or a student with a strong Kinesthetic Learning Style!). Kinesthetic Learners often have great hand-eye coordination. They typically love experimenting and are good at sports, drama and the arts. Their high levels of energy will make for a fun lesson time. The Kinesthetic Learner benefits from playing songs in different Pentascales Patterns. This creates a musical outlet for their need to experiment! The Kinesthetic Learner enjoys playing “outside the boxed position”. Playing in different Pentascales allows them to move around the keyboard. Pentascales are introduced on Page 78 of Prep 1 Rudiments. To support your Kinesthetic Learner in “getting it”, have them “do it” on your large Teacher’s Whiteboard. Jaydon is a Kinesthetic Learner who loves using the Whiteboard to “do it” himself in order to “get it”. Start by writing C on the staff and on the keyboard. Have the student play C on the piano, and then play the note that is a whole step (whole tone) above C (D). Write that note on the staff and on the keyboard. Use the square bracket to indicate a whole step (whole tone). Complete the C Major Pentascale one note at a time on the keyboard and on the staff while the student plays the distances on the piano (C └┘ D └┘ E ͝ F └┘ G). 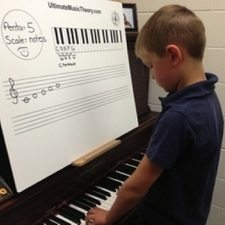 A Kinesthetic Learner will enjoy playing the Pentascale at different pitches on the keyboard (high or low) AND using different articulation (staccato or legato). Once the student has explored HOW to write and play the C Major Pentascale, repeat with G Major and then F Major. 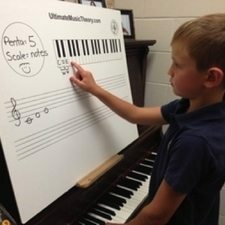 The Ultimate Music Theory Workbooks work with students of all Learning Styles. Taking theory concepts to the piano and using them with a student’s practical work enables students to become better musicians. Theory + Practical Application = Success! 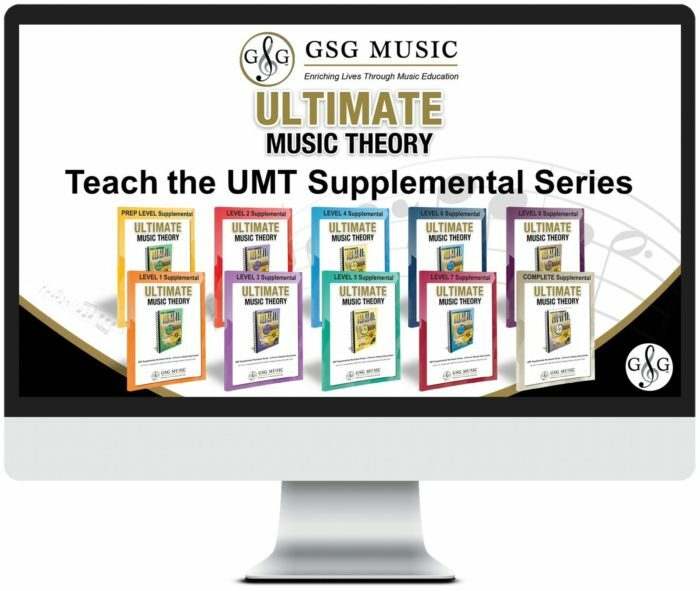 In the UMT Supplemental Series, we have created the resources for RCM Teachers to use the Ultimate Music Theory Series to prepare their students for the new 2016 Royal Conservatory of Music Theory Syllabus requirements. So-La Says to play this again with even more dynamics! Ti-Do Tempo Time! Let's play this Adagio, and then Andante, and then Allegro! So-La Says to look carefully at your work - did you transpose all the articulation? Ti-Do is Telling you to try this again. Let me know your favorite "So-La and Ti-Do Sayings"!